I love puppets! When I was a child, the way that fabric or felt, yarn or feathers, could come alive and have it's own voice and personality seemed like magic to me. Sesame Street and the Muppet Show were some of my favourite kids' TV shows (and I still watch them with my own boys). I have enormous respect for Jim Henson and the team of people who produced all those Muppet films. If I could go back in time, that would be my dream job. Maybe I can't have my dream job, but I can make my own puppets! 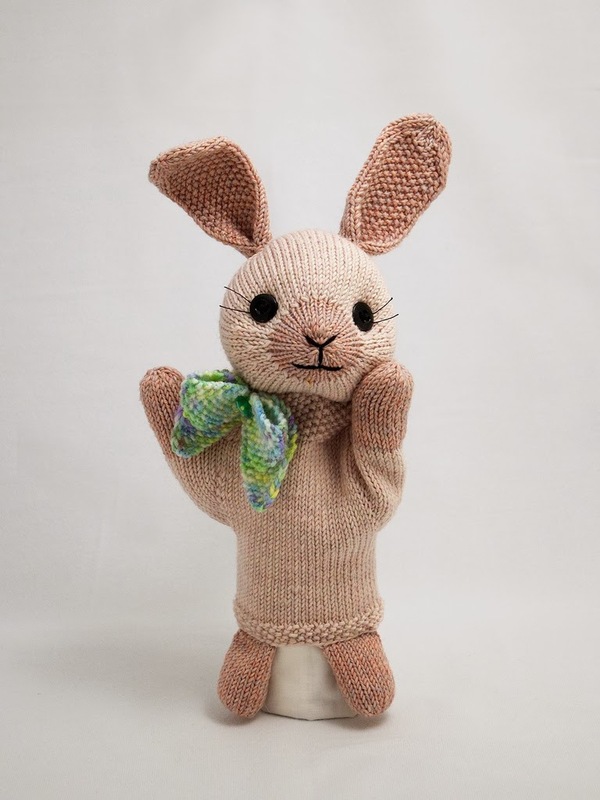 I decided to make my first puppet a rabbit, because they appear to be nearly the most popular toy animal (perhaps only slightly less popular than teddy bears). Although it added a lot more complexity to the pattern than I was used to, I knew I had to make the puppet in more than one size. There's nothing quite like a tiny puppet just right for small hands to play with, and sometimes adults like to get in on the fun too! While having puppets with mouths that open is ideal, instead I chose a simpler 2-armed design for my first puppet, which works really well from a mitten base. It's been a few years since I wrote the pattern, but I remember it took a lot more fussing to get it right than most of my previous patterns. I was determined to make it work! While I knew how to knit in the round quite well, writing a pattern that way was a fairly new experience. As well, I decided to go with a lighter weight yarn than I usually use for my toys, because I didn't want the puppets to be too warm. I chose a deliciously soft DK merino wool that came in some beautiful shades (sadly, a limited edition yarn that sold out quickly). I also wanted to include a little accessory - a sweet bow that is knit in two pieces, then joined in the middle (a technique I had been wanting to try). In the end I was very happy with the final toy. Everyone who sees them is charmed, and immediately puts one on to try it out. 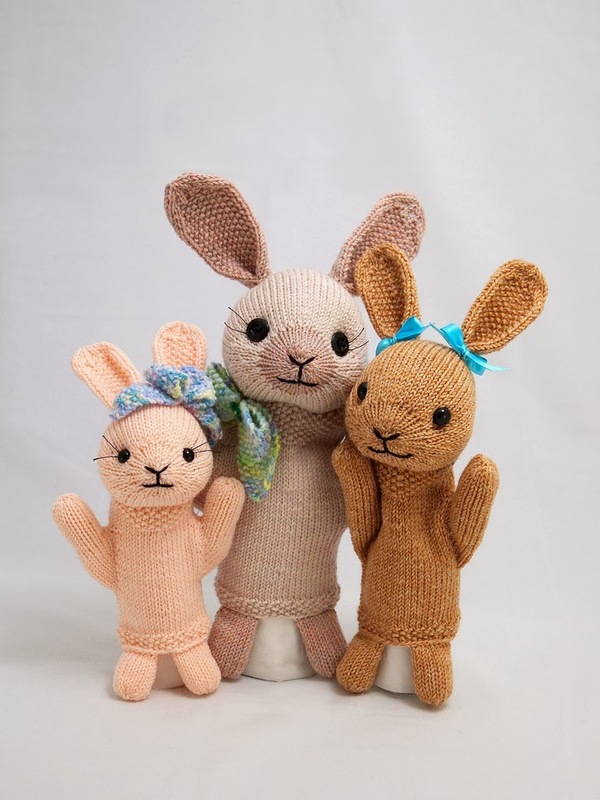 I was really hoping the bunny puppet would sell as well as my other patterns, so I could justify designing some other puppets. Sadly, that's never been the case. I hope that featuring the pattern this month will encourage a few more people to give it a try! As a bonus, it will be 50% off for the month of March in both my Ravelry and Etsy shops. Posted by Barbara Prime at 6:00 a.m.